Whatever offerings 200-day MAs could give to bulls, were not enough to tempt buyers. Markets continued their slide as the Russell 2000 followed the Nasdaq and Nasdaq 100 through its 200-day MA. Selling volume eased, which may reflect an oversell on Wednesday's distribution, but it's going to be hard to build enthusiasm for long term positions. Seasonal factors may yet prevail, and 'Santa' has plenty of time to make an appearance. 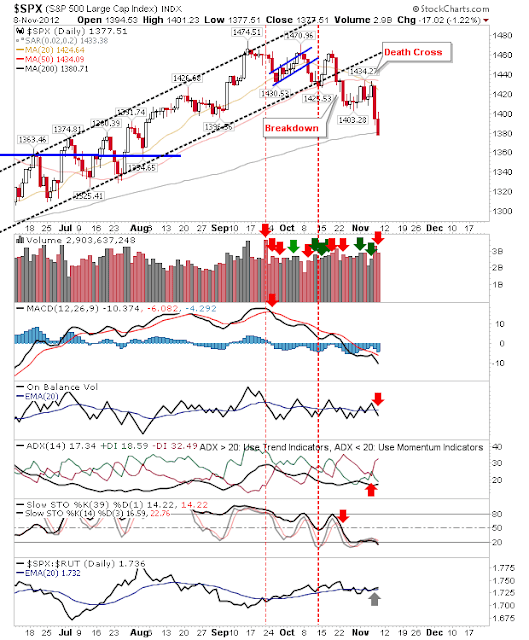 Today wouldn't be a bad place to start, but any early steps towards a rally are likely to be tentative. 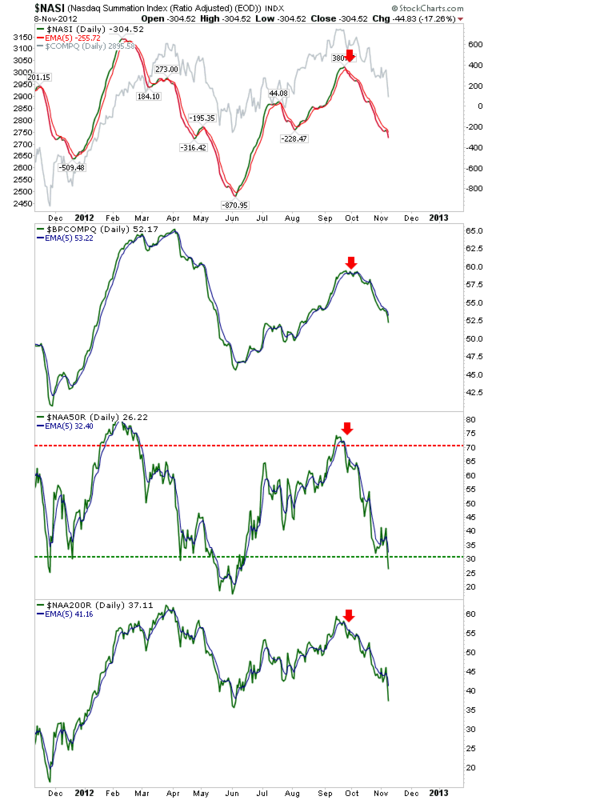 Reasons why 'now' may still be too early for a bottom come from breadth indicators. The Nasdaq Summation Index, Bullish Percents and Percentage of Stocks above the 50-day MA are all trending lower, but not all have reached areas which typically define swing lows for the parent index. The Bullish Percents ($BPCOMPQ), in particular, look 'too bullish' to suggest all the weak hands have left the building. Friday's focus will probably go on the S&P and its 200-day MA, which was clipped on yesterday's close. The 200-day MA hasn't provided much of a defense for the Nasdaq or Russell 2000 in recent days, but the S&P has the advantage of this been its first real test since June of this year. Futures suggest a mixed open. This might prove an opportunity for an early bargain, but if after the first hour buyers remain shy, it may be time to pull the lever and get out. Last hour of trading will probably be interesting too.